Hydronic Air Handlers have been around for years as a means to transfer energy from hydronic boilers and A/C units throughout the house by way of centralized duct work. However, in the past most air handlers were designed for high temperature water sources ranging from 140-180 F. This means that the heat exchangers could be relatively under sized and still do the job. With modern high efficient energy sources gaining in popularity, these old air handlers simply cannot do the job! Arctic Air Handlers are the new breed in efficiency and technology. 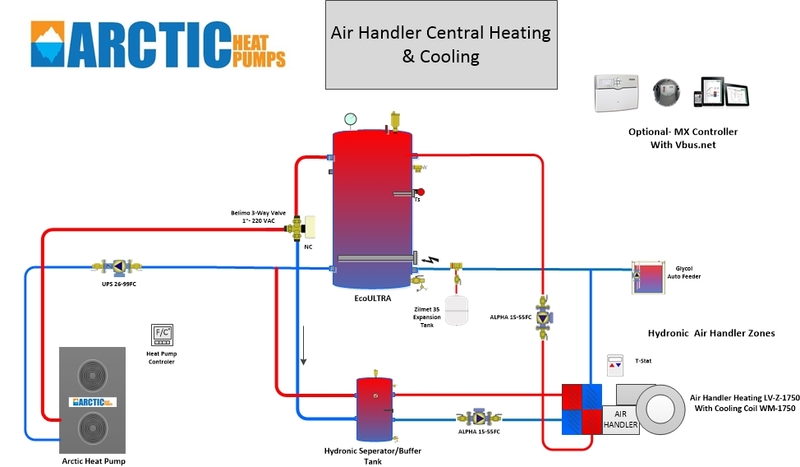 With features such as Variable Frequency Drive VFD and 6 row heat exchangers, Arctic Hydronic Air Handlers are the most effecient air handlers on the market for delivering lower temperature heating sources such as hydronic heat pumps, geothermal and condensing boiler, all of which are more efficient at lower temperatures. 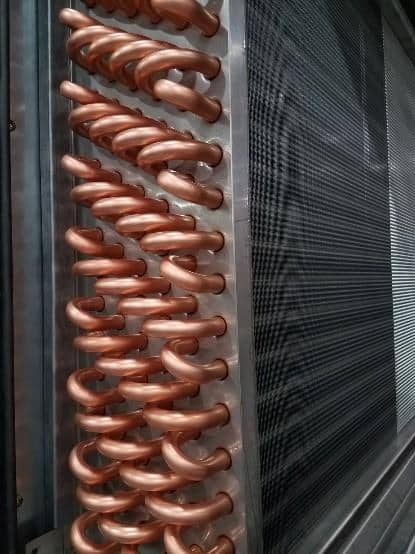 6 row hydronic copper & aluminum heat exchanger with 1” in/out lines. Unlike most hydronic air handlers our 6 row heat exchanger is nearly 400% larger than others. 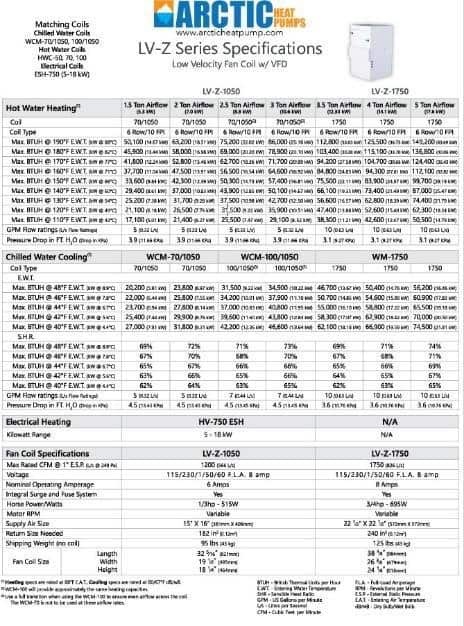 This is how we maximize the heat transfer when using lower water temperatures. However, this does not mean it will not work with traditional high temperature boilers. In fact the Arctic Air Handler can output up to 150,000 BTU at 190 F. The special internal loop design in the heat exchanger allows for low pressure loss of 3.1 Feet Head @ 10 GPM. 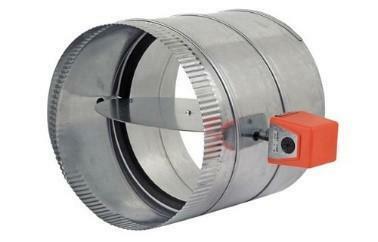 3 phase Direct Drive Motors use variable speeds. 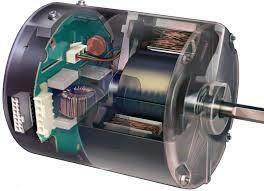 This means no start up capacitor is needed on the motor making it very quite and ultra-energy efficient. The motor only uses what it needs at all times, yet, powerful enough to deliver up to 1750 cubic of air feet per minute! Single phase power is converted to 3-Phase for the motor by the VFD controller. 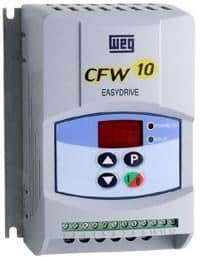 WAG Variable Speed Drive Controller – converts single phase 120 VAC to more efficient 3-Phase to operate the fan motor and modulates power output to match the load. (Less than 100 watts on constant fan speed). Easy touch setting allows users to program individual fan speed settings for cooling mode, heating mode, and fan only mode. The static pressure of the heating/cooling system is monitored and adjusted according to any changes such as closed vents or dirty filters. 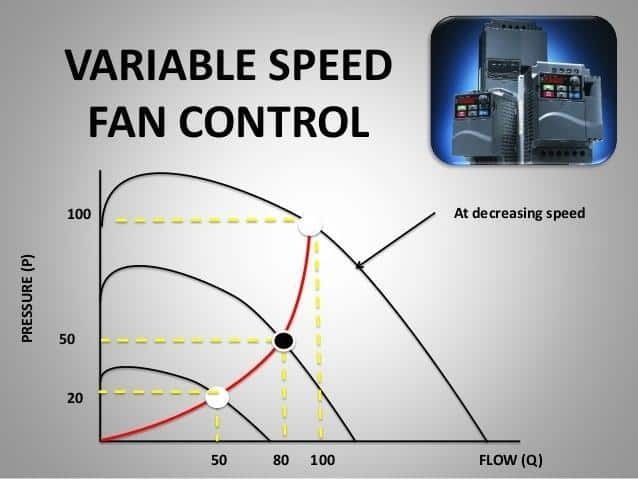 Variable Speed fan control allows one size of hydronic air handler to cover a much larger spectrum. 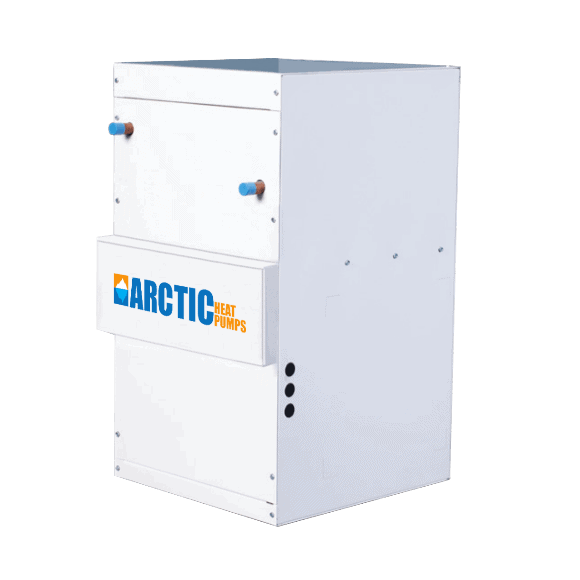 The Artic LV-Z-1750 can produce 3.5 to 5 tons of heating/cooling while the smaller LV-Z1050 can supply 1.5 to 3 tons of heating/cooling. The VFD hydronic air handler has a built in static pressure sensor that allows it to automatically set the optimum fan speed for the given house design. This means sizing the fan to the duct size is virtually eliminated. You can allow it to automatically select the best speed for any given construction or manually adjust the speed. This is all done by measuring the static pressure and optimizing the flow curve base on that pressure. Zoning – with VFD you can create air heating zones similar to that in hydronic heating. Using zone flap controls set to individual thermostats, the zones will open and close based on the need for demand heating/cooling. If both zones require heat, then the vent controls will be open to supply flow to those zones. If one zone is turned off, the zone damper will close. This increases the system pressure. Normal furnaces will continue to run at the same speed using excess energy. With the Arctic Air Handler, the static pressure sensor senses an increase in pressure as a result of a closed zone and immediately turns down the RPM reducing the CFM and reducing operating costs as well as excess fan noise.